Traveling There: Fligths from the United States to Bangkok are available on United, Northwest, Thai Airways, Aseana Airways, and Eva Airways, depending on the departure city. Phone numbers and Web links for these airlines can be found at this magazine's Airlines page. Visitors to Thailand are recommended to avoid automobile rentals and to take tours or public transportation due to difficult driving conditions in Bangkok and throughout Thailand. Staying There: Thailand's currency is the Thai Baht, which has recently traded at around 40 Baht per U.S. dollar. ATMs are available in Bangkok and Phuket. Both areas are major tourist destinations and have a large range of lodging accommodations. We took our tour of Thailand, its coastline, Malaysia, Singapore, and Hong Kong with Grand Circle Travel (Itinerary shown, plus optional flight to Hong Kong). It was well-organized and a good value. In turn, Grand Circle booked the cruise section of our tour with Star Clippers, which also has additional sailings directly available to the public. Thailand's unique culture places its monarchy and its Buddhist religion at the forefront. They are a friendly, tolerant people, as long as these two mainstays are not being challenged. Our recommended guidebook for Thailand, which we used extensively to gain an understanding of the culture, history, and sites is Lonely Planet Thailand by Joe Cummings, Steven Martin, 2001. Independent travelers to central Thailand who are looking for an excellent guide for day trips to the major sites are encouraged to contact Anil Sachaphimukh, cell phone: (66 01) 812-5868, email: anil@loxinfo.co.th. 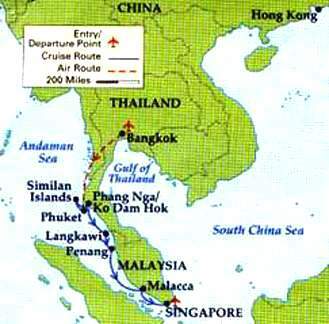 Return to Thai High on the Andaman Sea article.